A 2001 Crater High graduate, Ryan was an All-Conference football and baseball player while at Crater and was a four year member of the Honor Society. Following high school graduation, Ryan played baseball for Shasta College for two years, earning a first team All-Golden Valley Conference selection both years. 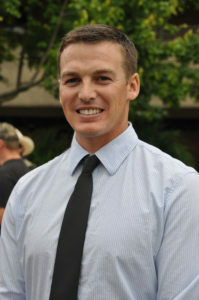 From there he joined the Oregon State baseball team in 2005 and 2006. In 2005 he was name All PAC-10 team while leading the PAC-10 in on base percentage. In 2006 he was a member of the Oregon State NCAA National Champion College World Series team. Ryan then played professional baseball for the Rockford River Hawks of the Frontier League in Rockford, Illinois, for the Yuma Scorpions of the Golden Baseball League in Yuma, Arizona and for the Eastern Hills Hornets of Western Australian Provincial League in Perth, Australia. In 2009 he became the Head Coach of the Eastern Hills Hornets in Perth. In 2009 he began serving as Head Evaluator/Instructor for Baseball Northwest which evaluates top high school baseball athletes, a positon he continues to hold. From 2010 to 2012 he was an Assistant Baseball Coach at Oregon State University. In 2012 Ryan moved to Dixie State University in St. George, Utah as an Assistant Baseball Coach remaining for two years. In 2014 he returned to Oregon when he was named the Head Baseball coach at Linn-Benton Community College, a position he continues to hold today. Ryan received a Bachelor of Science Degree in Sociology from Oregon State University. He is married to his wife, Alexandra. They have two children, Parker 4 and Elliot 6 ½ months, and live in Albany, Oregon.